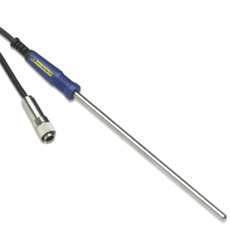 The PB-7002-3M is a stainless steel probe designed for low temperature (cryogenic) applications where the tip of the probe can be exposed down to -200°C (not the handle and cable). It comes with a 3m cable, and its moulded plastic handle and connector ensure it is robust and waterproof. This probe is also available with a 1.5m cable (PB-7002-1M5).